A major art exhibition poignantly paying homage to Christchurch will be emotional for everyone who visits it at the Bryce Gallery in Riccarton next week. The exhibition is open July 19 to 31 and includes iconic scenes of landmark places affected by the earthquakes including ChristChurch Cathedral, Cathedral of the Blessed Sacrament, Canterbury Provincial Council Chambers, the Arts Centre, Colombo Street, New Regent Street, Oxford Terrace, High Street, McKenzie and Willis, Alice in Videoland, The Strip, The Bog, Cashel Mall, Johnson’s Grocers, Hagley Park, the Avon River, Shag Rock & Sumner. Everyone who lived in Christchurch at the time of the February 22 earthquake has lost someone or something dear to them. Gallery owner Denise Bryce said a lot of people had moved on but she had found many others were emotional when they saw artworks of buildings and places that were special to them. ``Memories of places where weddings were held, places where they worked and good times past allow them to ‘feel good’ again. I get the most wonderful feeling of being involved in their lives when they buy one of these artworks as inevitably they share their story with me. 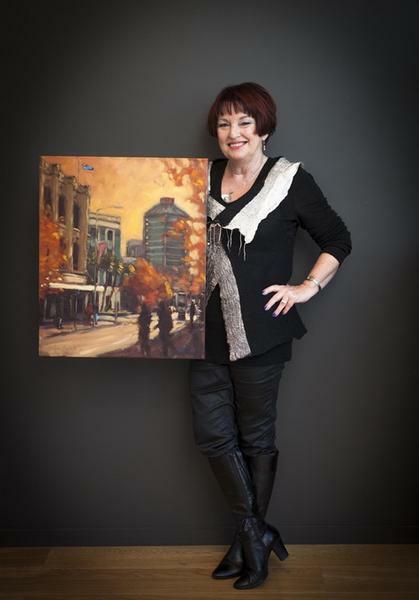 The inspiration for the show came from the release of Denis Robinson’s book “Christchurch – An artists’ tribute” released in February this year to commemorate the first anniversary. A portion of the book proceeds are being donated to the Christchurch Earthquake Mayoral Relief Fund. Copies will be available for sale during the Exhibition. A total of 15 top New Zealand artists have provided around 40 paintings on Christchurch for the special commemoration exhibition. The artists from Christchurch, Wellington, Auckland, Australia and South Canterbury are the late Austen Deans, Bill Moore, Don McAra, Galina Kim & Sue Spigel, Jacky Pearson, John Young, Julia Drake, Kees Bruin, Kelvin McMillan, Paul Hanrahan, Philip Beadle, Robert McDowell, Simon Williams and Sue Currie. Many artists had works destroyed and damaged in the quake. Robert McDowell’s grandson Jaime Robert McDowell Gilbert, was killed in the February earthquake last year. He was buried on a hill above Little River’s Wairewa marae. McDowell has done a large two metre wide painting looking from the hill down to the nearby lake. The art work will be gifted to the marae on behalf of Jaime’s family and will be unveiled this Saturday, which is Jaime’s birthday. Another artist, quilter Sue Spigel, was working inside the cathedral when the spire fell through the roof above her on February 22 last year. She broke her arm as parts of the church came tumbling down. The artist had been sewing a cloak for the Dean of Auckland in her cathedral studio at the time. Her piece for the Bryce exhibition is collaboration with Galina Kim, a painter. The quilts and paintings are of the cathedral.